While many know the jazz venue on St. Peter, you may be surprised to learn that Preservation Hall’s work and legacy stretches far outside the French Quarter. Operating as a music venue, a touring band, and a non-profit organization, Preservation Hall continues its mission today as a cornerstone of New Orleans music and culture. 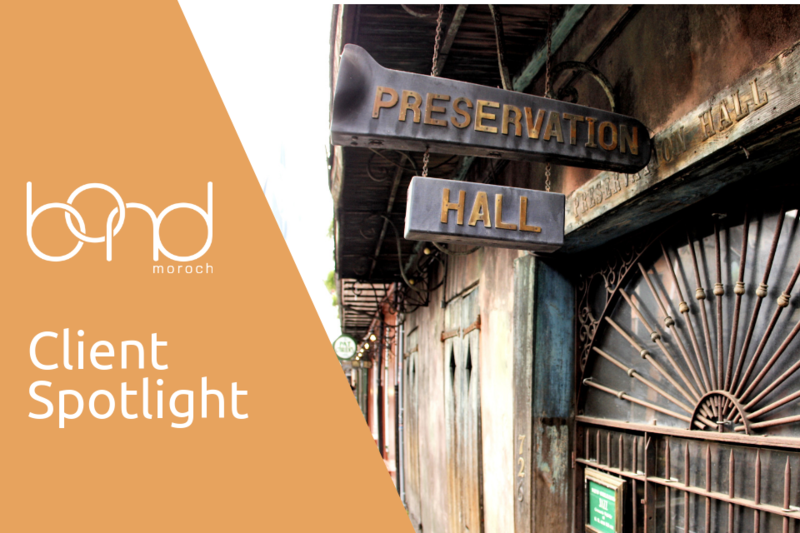 In today’s client spotlight, we’ll share more information on Preservation Hall and its various contributions to our cultural heritage. Situated in the heart of the French Quarter on St. Peter Street, Preservation Hall is an intimate, acoustic New Orleans Jazz concert venue that features ensembles from a collective of dozens of local master practitioners. Operating as a family business, the venue has supported the unique culture of traditional jazz in New Orleans, which developed in the local melting pot of African, Caribbean and European musical traditions at the turn of the 20th Century. Preservation Hall continues to delight listeners over 350 nights per year, giving audiences the chance to bear witness to the evolution of this venerable and living tradition. A cultural ambassador of the historic venue, as well as New Orleans as a whole, the Preservation Hall Jazz Band tours internationally not only to play shows, but to educate and inform both students and adults. Their work has held the torch of New Orleans music aloft for more than 50 years, all the while carrying it enthusiastically forward as a reminder that the history they were founded to preserve is a vibrantly living history. The band was recently featured in the documentary A Tuba to Cuba, a film that follows the band’s members as they retrace their musical roots from New Orleans to the shores of Cuba and discover a deep connection between their musical and diasporic heritage. A non-profit organization, the Preservation Hall Foundation is dedicated to serving the next generation of New Orleans musicians and listeners through education and community programs. These programs include providing private lessons to youth taught by New Orleans jazz musicians, coordinating group lessons with the Preservation Hall Junior Jazz Band, presenting workshops during Preservation Hall Jazz Band tours, and maintenance of the ever-growing Preservation Hall archives. The Foundation believes in providing experiential settings for students to learn by playing and through lasting mentorship from musicians in the Preservation Hall Musical Collective.